50 Spiritual Classics captures the diversity of life journeys that span centuries, continents, spiritual traditions and secular beliefs: from the historical The Book of Chuang Tzu to modern insight from the Kabbalah, from Kahlil Gibran's The Prophet to Eckhart Tolle's The Power of Now. The first and only bite-sized guide to the very best in spiritual writing, this one-of-a-kind collection includes personal memoirs and complelling biographies of such diverse figures as Gandhi, Malcolm X and Black Elk; Eastern philosophers and gurus including Krishnamurti, Yogananda, Chogyam Trungpa and Shunryu Suzuki; and Western saints and mystics such as St. Frances of Assisi, Hermann Hesse and Simone Weil. The last fifteen years have been a golden age in the genre of personal spitirual awakening, with names such as Eckhart Tolle, Neale Donald Walsch and James Redfield breathing new life into the literature. 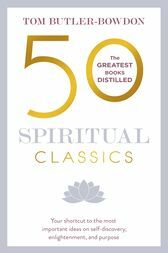 50 Spiritual Classics showcases these newer works alongside traditional classics such as St Augustine's Confessions and Teresa of Avila's Interior Castle, and conveys the great variety of spiritual experience. In its commentaries of both the conventional classics as well as new writings destined to endure, 50 Spiritual Classics makes universal the human spiritual experience and will inspire spiritual seekers everywhere to begin their own adventure.